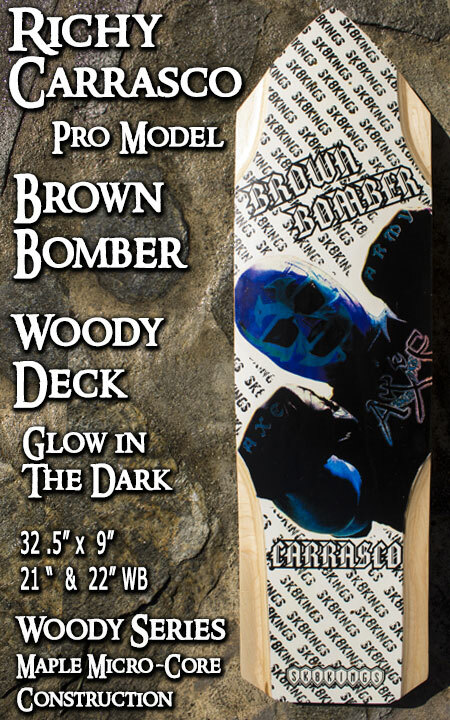 Dual wheelbase: 21" & 22"
Designed by Richy "The Brown Bomber" Carrasco, multi-National Champion and 100 Cone World Record holder. The latest design features fully-routered wheel weels and a new graphic colorway. The Bomber is mid-sized for quick turning at speed and is ideal for tight, hybrid and some giant slalom with adjustable wheelbase options. Pressed from our Axe Series racing molds to achieve the perfect concave and foot wedge tail needed for effective foot placement. This deck offers control for cutting and turning at speed for max acceleration power and stability all the way to the finish line. The Bomber is a great choice for slalom racing, freeriding, long distance pumping -- and can also be set up as a street cruiser by moving the truck location in rear and adding a tail skid plate. About the Masked Man graphic: As General of the Axe Army, Richy's Brown Bomber wrestling mask persona has become our Axe Army Mascot graphic and his pro model deck graphic as well. Inspired of course by Richy's Mexican heritage ... yes that's him under the mask. About Richy Carrasco: Former 1970's World Champion, 360 King and all-around '70's pro skater (Hobie, Pepsi, Powerflex, Flying Carrasco Bros) - Richy has been a top pro racer since the rebirth of slalom in 1998. Nicknamed the Brown Bomber - Richy has claimed three National Championship titles ('04, '06 and '08), a world speed record for 100 cone clean (2008) and countless victories over his 15-plus years in racing. Always a tenacious competitor, Richy is consistently on the pro podium and is ranked among the Pro Top 10 in the ISSA World Rankings. 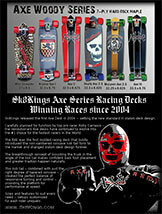 Richy is the founder of Sk8Kings Skateboards, the innovator/designer of the Axe series decks, 2X trucks and Turbo wheels and is the team captain/coach "The General" for our Sk8Kings Axe Army Racing team. Richy - we couldn't do it without you - the Axe Army Salutes You! Check out the vidoe of Richy setting his 100 Cone World Record riding his Brown Bomber.